I’m still not sure where the summer went. I’ve been meaning to post these recipes from our 4th of July dinner for several months now, but there always seems to be something pulling me away from the computer, and I just realized I haven’t posted anything but Daring Baker challenges . Time for a little catch-up. Our little sticky bun is now eighteen months old (!) and can walk, run, dance, climb, and almost reach stuff on the kitchen counters. He makes off with all of my Tupperware containers, and likes to help me unload the dishwasher, even before I’ve gotten the chance to run it, so a lot of our meals are prepared either very quickly or in short increments throughout the day. But he is still a very good little eater, and can handle practically anything thanks to his sparkly new molars and canine teeth. Not quite all of them had come through yet when I made these meals, but that didn’t stop him from eating lots and lots of thinly sliced beef and mashed potatoes. We usually don’t buy filet mignon, but as long as we were splurging, I took the extra steps of crusting our steaks with ground porcini mushrooms and topping them with gorgonzola-garlic butter. To round out the meal with some greens, I made haricots verts with a shallot vinaigrette, and stirred some ribbons of wilted chard—courtesy of a friend’s prolific garden—into the mashed potatoes. Process dried porcini mushrooms in spice grinder to fine powder. Transfer powder to plate. Sprinkle steaks with salt and pepper. Press steaks into porcini powder to coat both sides well. Heat oil in a small skillet over medium heat, and add garlic cloves. Toast cloves, turning frequently to avoid burning, until tender. Remove from the heat, cool until you can handle them, and peel off the skins; they should come off easily. Mash garlic into a paste with your knife or a garlic press, and mix in with the butter, cheese and parsley. Refrigerate until needed. Melt 2 tablespoons butter in heavy large nonstick skillet over medium heat. Add steaks to skillet and cook to desired doneness, about 6 minutes per side for medium-rare. Transfer steaks to plates. 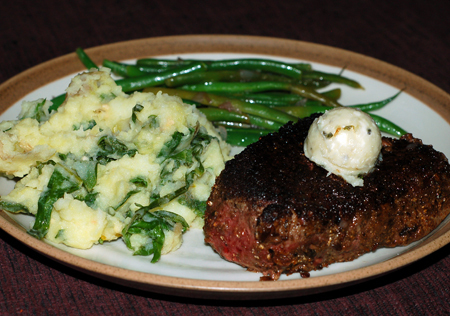 Spoon rounded tablespoon of gorgonzola-garlic butter atop each steak and serve. The next day, I made a batch of rustic potato bread with some of the leftover mashed potatoes. This is a recipe from Macrina Bakery that I’ve used before with gargantuan results, so I knew that I would be able to get more than one boule from it. I ended up dividing it into a 4 sandwich rolls and a standard loaf, all imbedded with decorative flecks of chard. 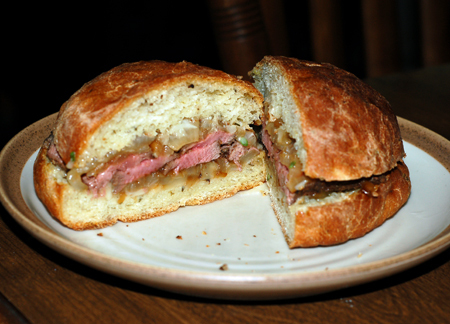 Split, toasted and spread liberally with leftover compound butter, the rolls made perfect vehicles for our extra filet, which I sliced thinly and slathered with caramelized onion for a sublime sandwich and a perfect end to the holiday weekend, if I do say so myself.